Welcome to the eighth and final part of the Basic Bunkai series. In this series of articles we've been exploring the basics of "bunkai" (kata application). The masters of the past told us that a single kata was a lifetime's study: it is therefore impossible to cover all aspects of kata application in a series of articles. Nevertheless, this series has covered many of the key concepts that you need to be aware of to begin your bunkai study. It is my view that traditional karateka who do not study bunkai will only ever experience a hollow shell of the art. It is within the application of the kata that we find all the depth and subtleties that, for me at least, makes the art of karate so enthralling and rewarding. In previous articles, we've seen that, in addition to the striking skills, the traditional kata record strangles, throws, limb-control, joint-locks etc. It is also a study of bunkai that makes karate a holistic martial art. As we said at the onset of this series, kata application is often presented as something "hidden" or "secret". Bunkai is not a mysterious secret knowledge that is the sole reserve of a chosen few. Anyone can get involved with bunkai training and study if they understand the "language" of kata. It is hoped that this series of articles has helped increase your understanding of that language. 1 All kata applications are designed to end the confrontation there and then. All the techniques in kata are constructed to either totally incapacitate an assailant or leave them in a situation or position that they are so vulnerable that they are effectively at your mercy. Any interpretation of the kata that would leave your opponent able to continue to fight is incorrect. Examples of this are the sequences that are often interpreted as multiple blocks with no follow up. You may remember that in part one of this series we discussed the limitations of blocking and established that the techniques now labelled as blocks were never intended to be used as such. We've also seen examples of how many of the "blocks" can be applied in simple and effective ways. 2 All parts of a movement are significant. Hands are not placed on the hips for no reason, nor are they "wound up" as a preparation for the following technique. No movement is without purpose and you need to ensure you understand the purpose of all parts of a kata motion. If the movement had no purpose, it would not be in the kata in the first place. Those who have been following this series will recall how we established that the hands are either injuring the opponent, or creating and maintaining an advantage. Hands are never inactive or held in a passive guard. Kata is not about the back and forth motion associated with martial arts sparring; it is about close-range combat and therefore both hands are always active. It is important to understand that all movements within the kata are designed for use in real fights. Although certain moves may increase strength or improve balance, that is not their primary function. Their primary function is to disable an assailant in civilian combat. The strategy, tactics and techniques that lead to success in one environment are frequently inappropriate for a different environment. When studying kata application, be sure you understand that all motions are designed for use in combat and that any physical or mental benefits are secondary. It's similar to how punching a bag for an extended period of time can improve your health. However, punches weren't designed to improve your health: they were designed to damage the health of others. Likewise, kata can improve your health, but that's not what they were designed for. Kata is about combat. It is also important to be clear on the type of combat that kata addresses. You are never turning to face a new opponent. Only the foolish and the unaware would not be facing their assailant before blows were exchanged. The vast majority of kata techniques are designed to deal with an opponent who is in front of you. The main reasons that kata techniques are performed at angles is to instruct the practitioner that they need to be at that angle, in relation to their opponent, in order for the techniques to work; or that by moving in that direction the transfer of their bodyweight will aid the technique's execution. 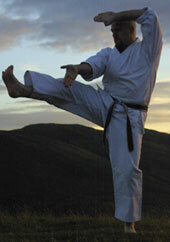 Because kata is a solo exercise, there is no second person to demonstrate the required angle. Therefore, the kata has to use a previous position to show the angle. This is one of the most important keys to understanding what the kata are showing on any given movement. Stances are never assumed because they look nice, or to strengthen legs, or to improve balance. Stances are taken because they put bodyweight into the technique or they help to unbalance the opponent. We have seen many examples of the use of stance throughout this series. When studying kata, look at the stance, the weight distribution, the resulting shift in bodyweight and the manner in which the stance was assumed. It's also important to understand that the end position is just that: the end of the technique. It's when the body is moving into the stance and the weight is being shifted that the technique is being applied. When performing the solo kata we are practising the 'ideal' movement, which is relatively easy to achieve against the thin air, but another matter entirely against another human being who is intent on doing you harm. When applying kata techniques your main concern should be the movement's effectiveness, not retaining an inch perfect performance. What is a graceful movement when performed in the kata will become rough around the edges when applied in an all out situation. When studying the true function of kata the visual appearance of a technique must never be a concern. The only valid measure is whether or not the technique disabled the opponent. A real fight requires competence at all ranges and with all combative methods. In this series we've seen how the kata contain joint-locks, throws, takedowns, chokes, strangles and strikes. It is the study of bunkai that makes karate a holistic and wide-ranging martial art. It can come as a surprise to some that these methods exist within karate due to the fact they are generally not widely practised today (they were in the past). However, an understanding of bunkai and a study of the older karate texts will confirm just how comprehensive karate should be. To be clear, karate is and always has been a percussive art. Also, the grappling aspects are simple methods to backup the core striking skills and should not be mistaken with the skilled and sophisticated methods associated with modern grappling. However, the basic methods of the kata are suitable for the environment for which they were devised. The majority of kata techniques deal with likely scenarios in civilian altercations; as opposed to the scenarios faced by warriors on a battlefield or competitors in a ring. Choki Motobu once said, " The techniques of the kata were never developed to be used against a professional fighter, in an arena or on a battlefield. They were, however, very effective against someone who has no idea of the methods being used to counter their aggression " ('Tales of Okinawa 's Great Masters' by Shoshin Nagamine). In a real situation it is statistically very unlikely you'll be facing another martial artist who has the same set of skills as yourself (and even if you did, the environment is different and the fight still won't be like a competitive match or dojo spar). Kata techniques are more likely to deal with shoves, clothing grabs, head-locks, head-butts and wild frantic swinging punches than as defences against "martial arts techniques", skilled submissions or modern sporting methods. It is also worth remembering that most fights occur at close-range and hence the majority of kata techniques are for use at that distance. There should be no doubt that techniques delivered to the body's weak points will have a greater effect than techniques that are not. You should be as specific as possible with regards to the areas struck when studying bunkai. That said, you should bear in mind that the accurate placement of strikes during an all out fight is not easy. Hitting a weak point can make an effective technique more effective, but it will not make an otherwise ineffective technique work. Hitting with power is the key. The kata give us plenty of information on the weaknesses of the human body. However, knowledge of weak points is not the main key to understanding kata. It is quite common to see flawed, modern-day applications that depend upon the opponent performing certain actions (like the example from Pinan Shodan / Heian Nidan that we saw in part six). It should be obvious that the opponent will never respond in a predetermined and agreed manner in a live fight. This is one of the great flaws with the "bunkai" demonstrated at tournaments as part of team kata events. Such demos are not true bunkai because they rely on the "opponent's" compliance. True bunkai is not something you do with a cooperative partner; it's something you do to an uncooperative opponent. Although we can't rely on the opponent's compliance, some physical responses are instinctive and therefore predictable. Such instinctive motions are therefore often taken into consideration by the kata. An opponent is always very likely to move away from any source of pain and any follow up movements should acknowledge this and any other similar involuntary actions. If you look the bunkai examples we've shown throughout this series you'll frequently see the use of these predictable responses. Master Anko Itosu - the creator of the Pinan Kata series - once wrote, " There are many movements in karate. When you train you must try to understand the aim of the movement and its application. You have to take into account all possible meanings and applications of the move." I feel that it is very important that the individual discovers their own unique understanding and expression of the underlying and unchanging kata principles. Also, many movements have more than one function or expression. Although some motions do only have a single use, others can be used in a wide range of ways. We need to be sure to follow Itosu's advice and explore all possible uses. We covered the idea of multiple functions in part four of this series. The key is to understand "why" the techniques work. Try to get beyond the simple memorising of individual techniques and endeavour to fully understand the principles of combat upon which the kata are based. Principles are far more important than techniques. Principles can be applied in an infinite number of ways, but techniques are very specific and hence limited. Endeavour to fully understand the principles of kata and learn how to fight in accordance with them. Whilst initially this understanding will be on an intellectual level, you should aim to integrate these principles into your subconscious. By concentrating on the principles, and the various ways in which they can be applied, the kata becomes an inexhaustible supply of martial knowledge and it is possible to appreciate why the masters of old said it would take more than one lifetime to fully understand a single kata. For bunkai to be valid, it all must be applicable to real situations. That is what kata was designed for, and that is the datum to which we must work. Not all karateka are interested in the practical side of the martial arts. Some practise the art for other very valid reasons. However, for your bunkai study to be valid, you have to work to the same datum as the past masters and have a good understanding of the environment in which the methods of the kata were created to operate. In order to understand kata, training must be realistic and sparring should not be based on the modern competitive rules but, as we discussed in part seven, should instead be kata-based. As we said at the start, bunkai is not an area of training only for the chosen few who possess the "secrets". Bunkai is something that all karate can study and practise. The concepts summarised above and the technical examples we've looked at throughout this series should have given you enough information to begin your personal study of this interesting and vitally important part of karate. I hope you've enjoyed these articles and I'm very grateful to you for taking the time to read them.